← Why is Agile adoption fraught with danger? I went to a skillsmatter session last night, and a great one it was too! 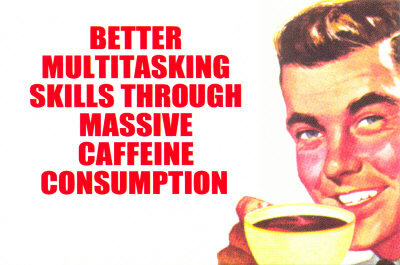 Coffee, the hidden key for multitasking? All about how to “multitask” and “context switch” in an Agile manner (NOT!). Greg Gigon dismissed the myth of multitasking (well at least for the male) by highlighting that just because computers can do it, with their multiple cores, we only really have one, albeit large mysterious and internally unknown and so we cant really multitask. Greg supported this with various statistics about how trying on two tasks at once inevitably takes longer than if you did one at a time. The key phrase for me was “attention rich”, quoting biologist Dr. John Medina “We are biologically incapable of processing attention rich inputs simultaneously”. This multitasking is not a new problem. But it has been recently exacerbated by the role that media and pcs, phones, twitter, facebook etc.. have taken in our lives. Well Greg led us on to talk about how we can AVOID multitasking in our daily working lives. The biggest one he talked about was removing interruptions. Often the problem is also us, in that we interrupt other people from working because of our own problems. Pomodoro technique – (see Gregs blog at the bottom for details on that) its essentially a time focus technique, working with the natural ability of the brain to focus on tasks for short periods of time. Paired Programming makes it less likely to check emails, twitter, facebook etc, you are also less likely to be interrupted by people! Kanban helps limit the number of tasks people are working on. Also music, that is “familiar music”, can help people tune out and focus on what they are doing, this is contrary to what I believed at the time, but it does make sense. I personally cannot concentrate well listening to music, but if its music I know well apparently the brain processes it differently and acts as a wall against other background interruptions. This will obviously not work for new music or radio. I’ll admit that when I have worked listening to music its because I am doing mundane work or less brain intensive work (think documentation). I might also add a couple of my own ideas and one is where you simply have a todo list, visible and in front of you. My personality is that I like to achieve things, and I feel like I have been rewarded if I can strike things off my list of things to do! I am also in the process of using my very own task board, this makes what I am doing very public, and transparent, and therefore will also help me keep focused during the day. manage people’s ability to be interrupted. Another idea is to manage interruptions using visible signs (ie. headphones on head means stay away) or even messaging statuses. You could also make a couple of programmers available for contact and by implication the other programmers are not available to people like the business. Obviously getting the balance right is important. 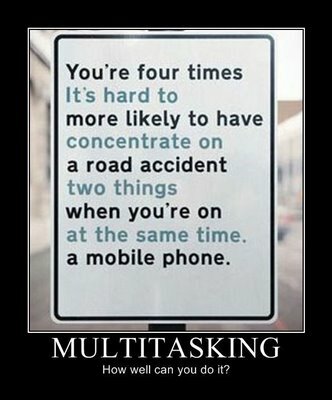 this is good too on multitasking! This entry was posted in multitasking. Bookmark the permalink.